Look how cute these little veggie cups are? 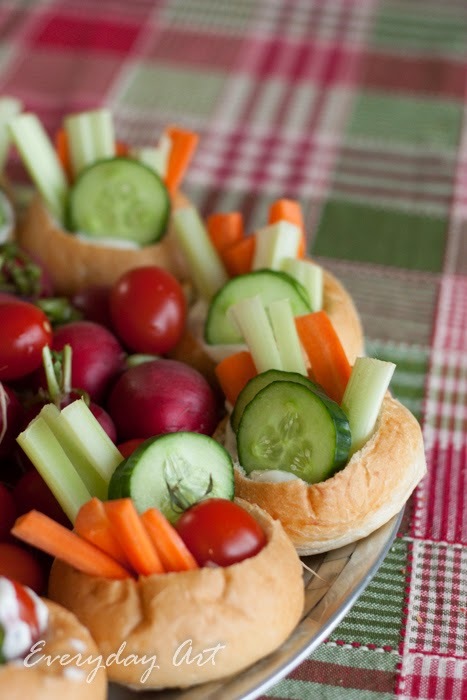 It's a fun new twist on a veggie tray--everyone gets their own individual vegetable cup. My mom brought the supplies to make these last time we were having a dinner party at my place, and it was a big success. 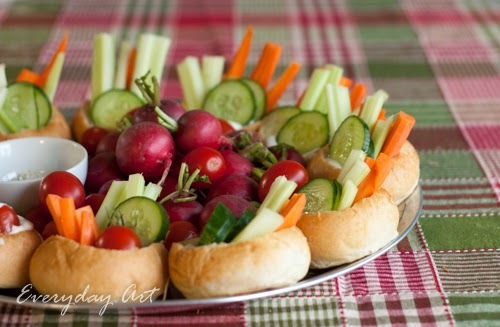 Each "cup" is a hard roll that has been hollowed mostly out, filled with vegetable dip and sliced vegetables. They are portable, fun, attractive, and healthier than most appetizers out there. Want to make some? Here's what you do. 1. Prepare rolls by slicing the tops off and hollowing them mostly out (not too thin!). 2. Place about 1/4 cup of your vegetable dip into each cup. 3. Arrange the vegetables in the cups, and you're done!